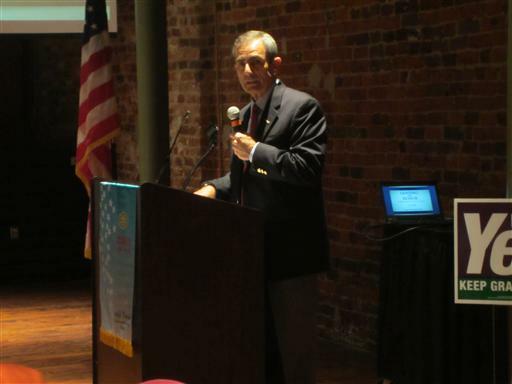 Retired U.S. Air Force Col. Lee Ellis shared the leadership principles that helped him and his compatriots survive as prisoners of the Vietnam War to the Grapevine Rotary Club Wednesday, Oct. 3 at noon at the Lancaster Theater. Ellis was held in various prisons in the Hanoi area for more than five years. He has received two Silver Stars, the Legion of Merit, the Bronze Star with Valor device, the Purple Heart, the POW Medal for his service in Vietnam and now an honorary award from Grapevine Rotary. 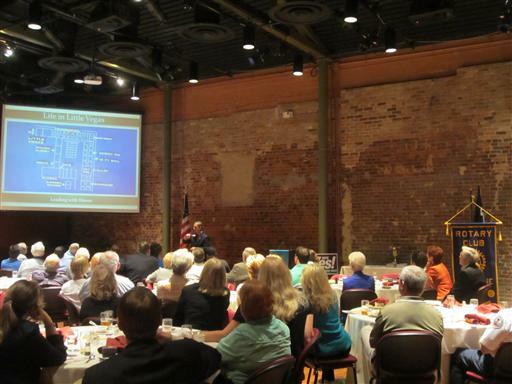 Grapevine Rotary President Duff O’Dell attended high school with Ellis in Commerce, Ga. She had the opportunity to introduce the retired colonel before he got up to speak. After thanking fellow veterans in the room for their service, Ellis began his presentation by describing the background of where he grew up and the role his mother played in his life. Two years and a couple of months after graduating from college, Ellis was trained and headed to the Vietnam War. He was about 23 years old at the time. Ellis described his experience during the plane crash that would lead to his captivity. He said the plane blew apart and there was smoke in the cockpit. He remembered his training and pulled his ejection seat lever. Once Ellis’ parachute brought him safely down, he radioed his wingman and waited for the oncoming enemy troops. Ellis fired a warning shot over the enemy troops’ heads, and the troops did not budge. One of the enemy troops told him to surrender and Ellis would not die. “I decided that was probably the best advice I was going to get that day,” said Ellis. Ellis then recalled his journey to the various POW camps. He showed blueprints of some of the camps and spoke about how the enemy troops tried to get the American soldiers to make propaganda for them. Ellis described living conditions, torture and how he and his compatriots developed their own forms of communication. He remained vigil with advice he received from a senior-ranking officer. “He said, ‘Be a good American and live up to the code of conduct. Resist and take torture up to the point of permanent mental and physical damage, and then give as little as possible. Be ready to bounce back after the next round. Resist again. Stay united through communications. Pray every day and go home proud,’” said Ellis. Ellis returned to America the same day as Senator John McCain. When he arrived in Commerce, Ga., some could not believe he still remembered everyone’s name. “I said, ‘I haven’t hardly met any new people in six years,’” Ellis joked. Ellis then opened his presentation up to a question and answer section. 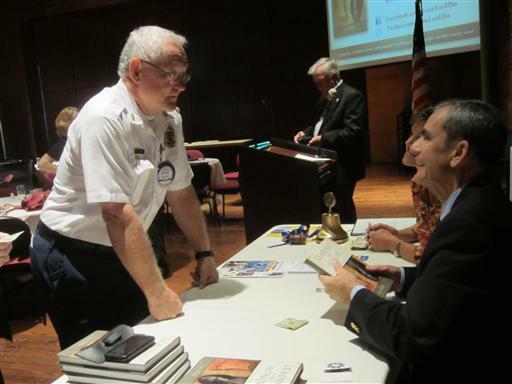 After receiving awards from rotary and Congressman Kenny Marchant’s office, he signed copies of his book for those in attendance.